Thank you for your interest in summer camp jobs with us at Camp Shohola. We have been very fortunate over the years to have staff members of the highest caliber come and make Shohola a very special place for our campers. 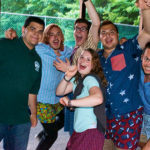 If you are an energetic person who is able to work as part of a team, and you are willing to work very hard to make a summer experience special for someone else, then you are the kind of person we’re looking for in summer camp employement. Shohola’s staff is made up of nearly 100 men and women from around the country and around the world. We are predominately male simply because we are a boys camp, but we do hire several female staff members each summer for camp jobs. Most of our staff are college age adults, but we have staff members from age 17 to age 60 at Shohola. All you have to be is young at heart.